Lookup a word by tapping or selecting it using the Word Index. Or, use the built-in keyboard on all Kindle models as well as many smart phones and tablets. PC and Mac computers work the same but the mouse is used to select words and passages. Sentences containing your word will display. Each is identified as to the book (BB or 12&12) as well as the chapter name and page number. Big Book page numbers are for the Fourth Edition. While reviewing your "hits" you may see another word of interest. Simply tap the new word or select it with the cursor. Sentences containing that word will appear. Internet access is not required to use 164 and More; all content resides on your device. To purchase click here for the listing on Amazon. In addition to the Kindle itself, 164 and More will run on smart phones including the iPhone, Android phone, BlackBerry, and Windows Phone 7. Also supported are iPad and Android tablets as well as PC and Macintosh computers. 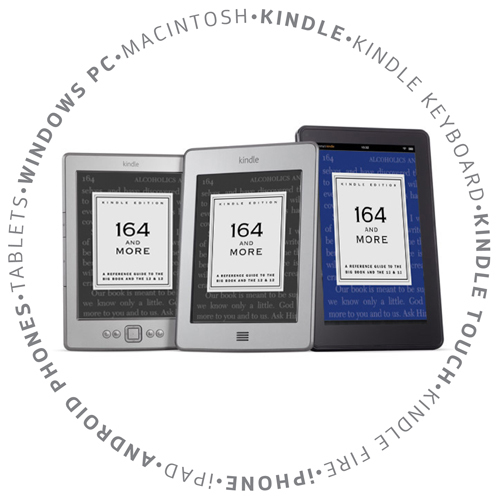 Before purchasing 164 and More, you will need to install a free Kindle Reading App for your smart phone, tablet, or computer. Go to the Kindle Store on Amazon.com; Reading Apps are listed on the left margin. Using a Kindle Touch, smart phone or tablet, you never have to type anything. Simply use the Word Index, tap a letter of the alphabet, and then tap the word you want. 164 and More contains a number of "how to" screens. There are sections for each Kindle model, smart phones, tablets, and computers. Pick your device and learn recommendations for getting the most from 164 and More. 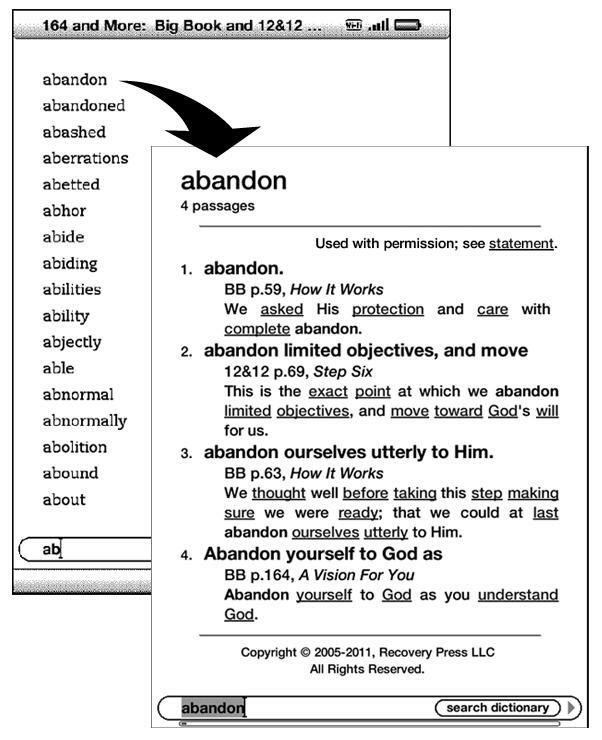 You can open a PDF documentation file containing the "how to" screens. 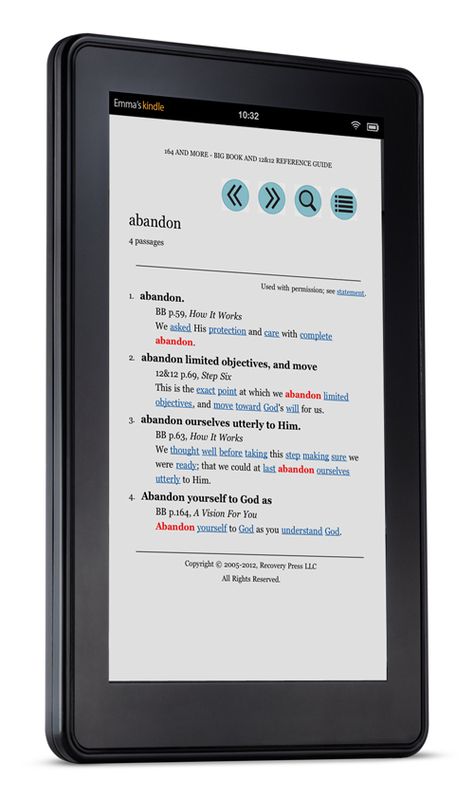 Another option is to purchase 164 and More from the Kindle Store and begin using it. If it does not meet your needs, you have 7 days to receive a full refund from Amazon.com. The Kindle Edition of 164 and More is available for download from Amazon.com. Click Download Now to purchase. You'll have it on your Kindle within minutes. The 164 and More™ Book, eBook, and Web Site are all CONCORDANCES which display passages from the Big Book Alcoholics Anonymous, the Twelve Steps and Twelve Traditions, and the A.A. Grapevine (A.A. Preamble only). Sorting and rendering passages in the proprietary format of the 164 and More concordance does not in any way imply affiliation with or endorsement by either Alcoholics Anonymous World Services Inc., or The A.A. Grapevine, Inc. Further, A.A.W.S. Inc. and A.A. Grapevine Inc. have no objection to the use of this material in the 164 and More concordance. Copyright © 2005-2013 by Recovery Press. All Rights Reserved.